It is not looking good for the four major affiliates. Iowa has been eliminated while Myrtle Beach is almost kaput at well. Tennessee and South Bend are technically still in the hunt, but they both have 6+ games to make up. There is much hope in Eugene. Despite a slightly sub-500 record at 11-12 in the second half, the Ems are tied with Salem-Keizer but own the tie-breaker for a post-season appearance (it would be their third straight). Cubs 1 in Mesa was a first half champ and has the best overall record in the league at 32-16. For Cubs 2, they have just a week left to make up three games against the hottest team in the league, the White Sox. On Friday, I wrote for BP Wrigleyville about who could the pitcher of the year in the Cubs’ system. When I wrote the article earlier in the week, it looked like there could be four names in the running. In the course of the week, one pitcher looks like he is beginning to separate himself from the pack a bit. Cory Abbott from Myrtle Beach threw six scoreless innings with 9 Ks on Friday night. The 22-year-old right-hander has been improving month-by-month since he was promoted to Myrtle Beach. After a rough June with a 4.74 ERA, Abbott responded with a much better July at 2.91. Now, in August, he’s made just three starts with possible 2-3 more starts left. He has 1.06 ERA in his three August starts with a 0.82 WHIP. 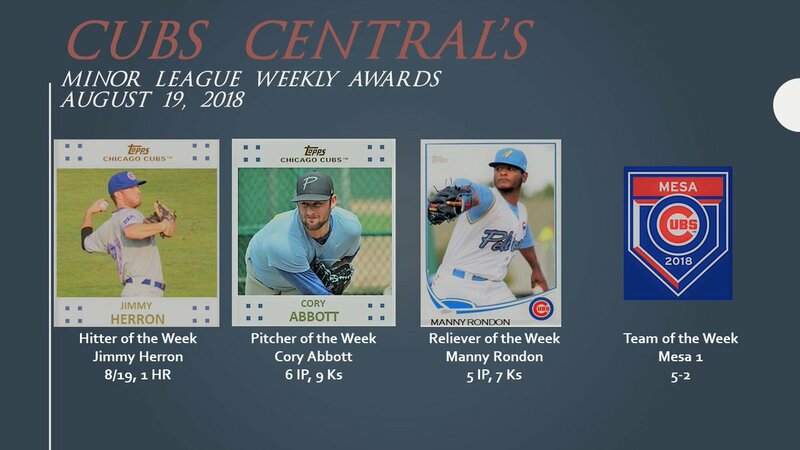 For the year, Abbot has 105 innings completed with a 2.74 ERA, a 3.00 FIP, and 120 Ks to only 33 walks. That’s an impressive first full year as a pro. I have been thinking a lot about several of the prospects at Tennessee lately. In the next year, a few them could help out the big league club if necessary. AA success is a pretty good barometer of AAA success and advancement to the MLB level. In fact, many of the current MLB Cubs had dominant seasons at AA and spent little time at AAA Iowa. There are exceptions like Albert Almora and Javy Baez, but the rest of the position player corps were in and out of Iowa in a hurry. This year, Zack Short and Michael Rucker are two flashing neon prospects who might be seen playing in the friendly confines very soon. I can see Zack plying his hitting skills next summer. 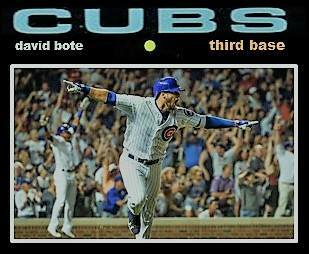 His ability to hit for power, get on base at a high clip, and play good defense endears him to many in the Cubs’ system. 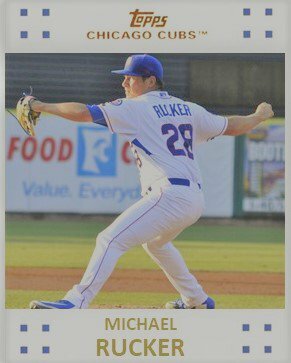 The great thing about Michael Rucker is that he has had success as a reliever and a starter. His stuff ticks up a bit out of the bullpen to 95/96. Rucker’s greatest asset, though, is that he is a strike throwing machine at almost 70%. In addition, I am looking forward to seeing which players on the Smokies’ roster get a call to participate in the Arizona Fall League. PJ Higgins is one player I have already mentioned, along with Zack Short and Trent Giambrone. Matt Swarmer might be worth getting more looks against the elite competition of the league. Swarmer has had a very good year at two levels and he could get a head start on 2019 with the Mesa Solar Sox. As you can see, Cubs Central has a little bit cleaner look as I went with a new theme. While it looks good on a computer, I think it looks even better on a phone. I hope you like it, too. The kids showed up to school last week and instruction in Ancient Civilizations and US History began. As a result, I am beginning to slow down a little bit when it comes to writing. I do have two articles planned for the next week. I will hopefully be publishing profiles about Delvin Zinn from South Bend and Paul Richan from Eugene. They might be shorter than your average prospect profiles. We will see. However, my production of baseball cards seems to be at peak levels. With close to 120 cards in August, the flow of cards will soon start to slow down as the season ends the 3rd of September.